Students and professors at the University of San Diego have a new way to share photographs, videos, interactive conversations and comments in real time. 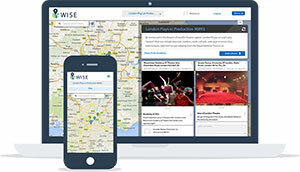 Launching today, the World Interactive Study Environment (WISE) is an interactive platform built on geospatial technologies designed to help users apply classroom concepts directly to the real world. "USD is committed to developing globally aware students through enhanced learning experiences such as studying abroad and providing them with access to innovative technology," said Andrew Allen, USD provost and vice president, in a press release. "Imagine not just reading about a foreign place, but immediately having access to students' experiences who have been there or a professor's unique and personal comments and pictures about that location all in one cohesive platform." Using the WISE desktop or mobile app, students both on and off campus can explore locations virtually using the integrated Google Street View; pin areas of interest on the map; add information, photos and videos; and comment on other users' pins. For example, students studying abroad can visit a landmark and immediately receive messages from peers who have previously been to the location. Instructors can gauge student interest in a particular topic, and monitor trends from semester to semester. According to Avi Badwal, senior director of enterprise technologies at USD and WISE development lead, "We set out to build a study environment that increased student engagement by connecting them directly with people, places, and things in their global environment and in the process brought classroom concepts to life. WISE is a new tool that will provide our faculty and students with the ability to teach and learn in a completely new way, and we are all excited about it." For more information, visit the WISE site.